PEER Celebrates Earth Day with Mayor Bowser, DC DGS, and the On-Site Solar Project Team Recognizing One of the Most Powerful Solar Systems in City & Nation — PEER Consultants, P.C. 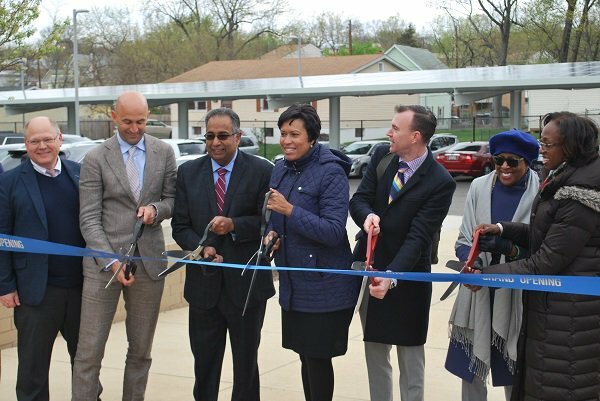 On Tuesday, April 17, Mayor Muriel Bowser kicked off “Earth Week DC” with a ribbon-cutting ceremony at HD Woodson High School in DC to celebrate the launch of one of the largest on-site solar projects in the country. PEER Consultants, P.C. (PEER) is the managing partner of the DC Solar Joint Venture selected by the District of Columbia Department of General Services (DGS) to develop, install, own and operate solar facilities on various municipal sites. The project now consists of 20 facilities and 2 MW of capacity. The fourteen (14) government-owned sites that were initially designated for this project are reaching completion. PEER led the overall development effort – including securing financing through the sale of the systems upon completion – to Standard Solar Inc. and assigning the Power Purchasing Agreement (PPA). PEER also managed the Engineering, Procurement and Construction (EPC) Contract with our joint venture partner, Solar Park USA. PEER provided engineering design services for all the sites and secured all required municipal and utility permits. PEER provided engineering services during construction and developed O&M manuals and provided training to facility managers at each site as well as Standard Solar staff. This project is part of the school modernization program where solar panels are installed and connected behind the electricity meter. This results in a reduction on the electricity bills for the schools, saving the schools money, and making room in the budget to add solar PV and renewable energy generation educational workshops/courses to the curriculum. Clean Energy DC and the District’s goal of becoming the healthiest, greenest, and most livable city in the nation. Clean Energy DC is the District’s plan to shift towards clean energy (like wind and solar power) to cut pollution, save money, and create jobs. Similar to what the plan proposes, the intent and results of the On-Site Solar Power Purchasing Agreement that PEER and the DC Solar JV have been working on, is helping to achieve the goal of installing significantly more local solar power, along with systems to share energy in the respective neighborhoods. One of the most valuable elements of this project is that the services are being provided mainly using the skills of local staff. In addition, it has expanded upon the capabilities of the diverse workforce within the emerging renewable energy marketplace. It has provided the opportunity for newly trained staff to work on their first solar project. Over two-thirds of this project as a whole is performed by local District-based Certified Business Enterprises (CBEs), some with little or no prior solar experience. More specifically, the installation subcontractors are all local CBE-certified.